The first time I moved out (after college) my kitchen didn't have a window and I had a lot of free time. I read up on proper food storage, mix yeses and mix-nots and how to determine if growth on cheese was appetizing or deadly. Since then I've moved over a dozen times into all types of kitchens and storage areas and forgotten all the Basic Rules of Storage. 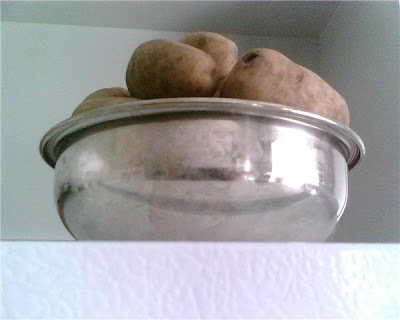 See how pretty these potatoes look in their bowl on top of the fridge? Look at how all that potato-ruining light is just reflecting. Note to self: Potatoes like dark, dry places. And see how my plantains sitting so prettily under the window are quickly ripening past Anny-Approved levels of Deliciousness. 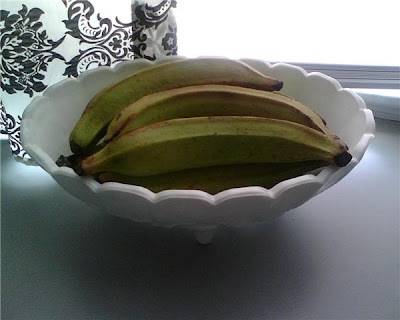 Note to Self: Keep plantains in the fridge. And when in doubt drop by StillTasty.Com queue their database. Really no tomatoes in the fridge? I never heard that and always keep mine in there...why not? And I did not know that potatoes were so picky about their company!! Tomatoes supposedly get very "fleshy" and lose a lot of flavor being kept in the fridge. I think the best way to store them is somewhere away from light with the stem side down to prevent bruising. Potatoes look so unassuming don't they! ?